A rehabilitation centre for online shopping addicts opens in London this week. 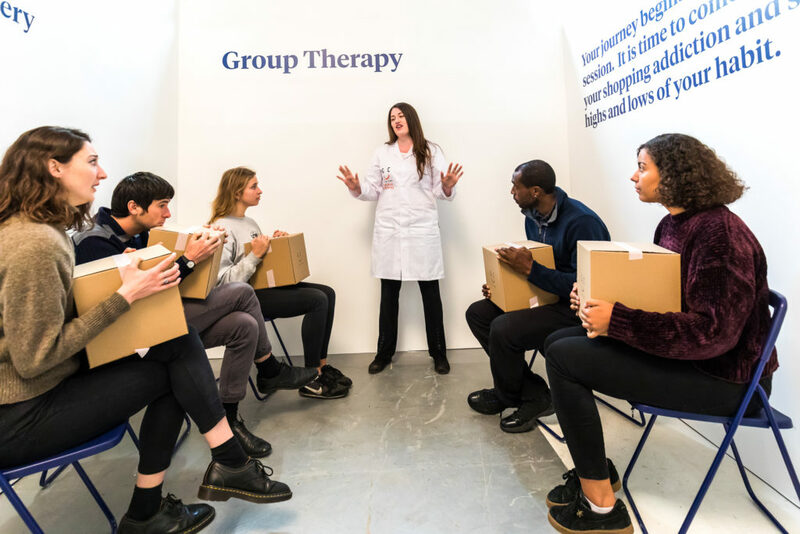 Billed as a world first, The Giant Corp Rehab Centre is open from 10am to 5.30pm tomorrow (Friday October 12) and Saturday (October 13) on Redchurch Street in Shoreditch. For those who want to kick their online shopping habit, tickets are available here and walk-ins are welcome. Run by trained therapists, the centre will offer a variety of interactive sessions, from group therapy and a digit distraction classes to free workshops (such as floristry and barista) with independent business owners. The company behind the initiative is iZettle, a fintech (financial technology) company for small businesses. It explained that the aim of the project is ‘to make consumers think twice about their shopping habits, realise the damage it’s having on the high street, and urge them to swap their ‘one-click’ cravings for local love’. Research conducted by iZettle has revealed that one in three Brits believe they are ‘addicted’ to shopping online and ‘one-click’ buys from giant retailers, with one in 12 admitting to making purchases every day. The survey showed that the biggest addicts for shopping with online retail giants are in Greater London (39%), West Midlands (37%), Yorkshire (32%), North West (29%) and North East (28%). Edward Hallett, managing director of iZettle UK, said: “Our research shows that it’s time for consumers to start thinking about their shopping habits and choices, to keep the high street alive. Athena Duncan, co-founder of floristry business Rebel Rebel in Hackney, is running a workshop at the centre teaching flower arrangements. She said: “We need our high streets and shops so we can experience real things and touch them, taste them and feel them. In 10 years’ time, when we turn round and there are no high streets left, it will be too late.